Roll up, roll up! Hand picked for you today we have the very best in what Topshop has to offer to polish off your psychedelic summer look. Looking to layer that outfit in ALL THE COLOURS? Fancy some leggings which have an expertly placed part of the pattern on your ovaries? Maybe when it gets a bit nippy you’re after a snazzy gilet to stay warm. You want it? They got it! And just so no one recognises you in these killer designs, don’t forget your PEEP sunglasses. But seriously, have you ever yearned for a slashed sweater which channelled your inner unicorn? This number from the Ragged Priest takes that yearning and turns it in to all out unicorn-that ate a bag of rainbow drops-then drank a tango ice blast-then puked all over itself garment, ready for you to enjoy. Even better, it has been reduced so it’s affordable for every budget! Style this under the muggy lime shades of your new favourite fur gilet and you’re ready for that date at m&m’s world with the Cookie Monster. Looking to really blend in to the crowd at the festivals this year? Well don’t forget your hair accessories! Although you might want to go for something a little more subtle so your friends can find you when you’re like totally chillaxing in the ambience of the fest vibes, man. 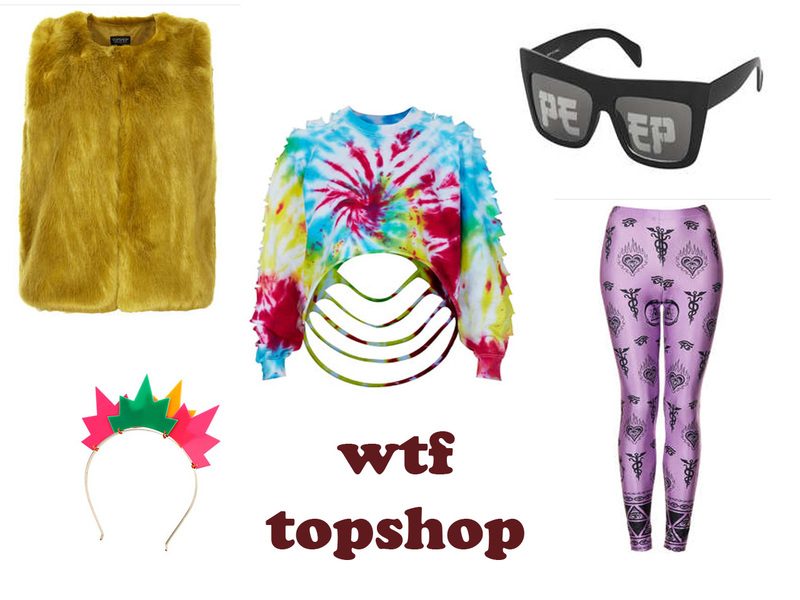 Find more ‘WTF Topshop’ posts here.